This post is part of my professional education portfolio. Permission gained from those in photographs to have these published on social media. There is a constant discussion in my workplace to find more engaging ways of teaching. I thought I would share some ideas and concepts which have helped me to engage with young people. While those around me usually hear me promote online, virtual and technology based learning I wanted to let everyone know that choosing the mode of teaching is not limited to online or technology but tailored to content, environment and to engage those you educate. As my teaching experience grew one of the most important lessons I learned was reading the class and adapting the methods, I use in education to match the needs of those I educate. In my spare time, I teach 15 to 18-year-old youth on a childcare (babysitters) course and caregivers course and with inspiration from my friends I have implemented experiential learning into this teaching. The photograph below is of me with two young people I recently taught about Personal Protective Equipment (PPE). While theory and knowledge around infection control is important experiencing this allows students to put themselves into the situation and reflect on their experience uses all senses and allows for problem-solving. 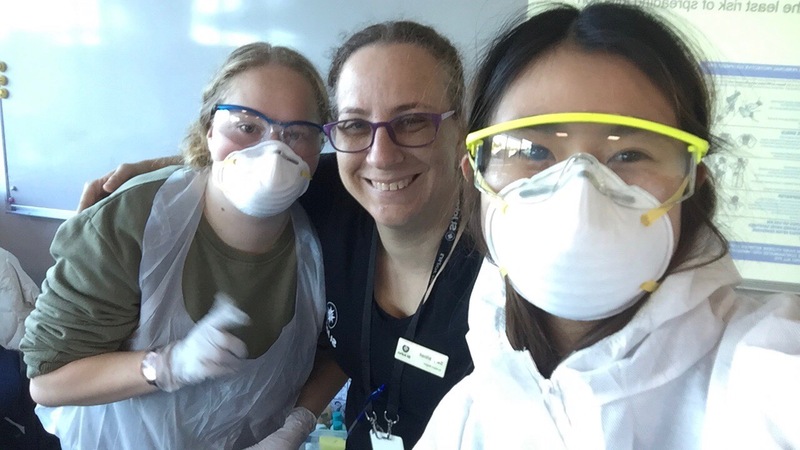 These students were asked to describe how they felt wearing PPE, identify risks, benefits and risks and relate this to how their patients may feel when they first meet someone wearing PPE. Another point I would like to mention is that I never stop learning from those around me, while I am a “geek” and love technology, this class explained how to use snap chat and why many teens choose this as their social media platform. On childcare courses which I teach one of the activities is to learn how to care for a baby. First thing in the morning I discuss legal requirements for babysitting, and we brainstorm the risks, requirements and discuss neglect. Soon after this, I issue students with a “baby” (doll) which they must care for eight hours (I am kind – there is one doll between two students). It is amazing how attached the students become and how much caring I see. 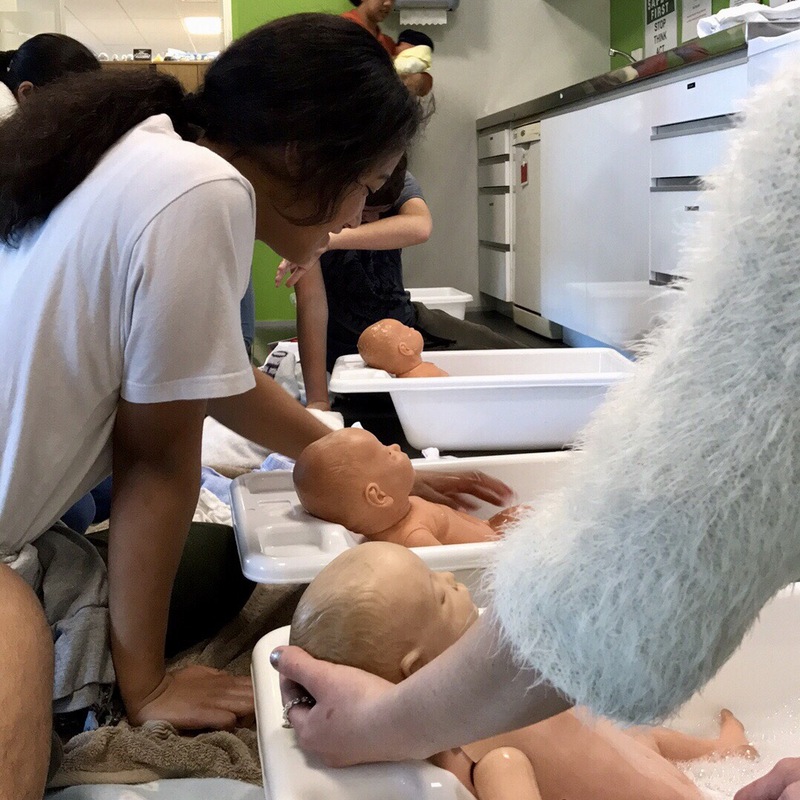 The photograph below shows students learning to bath a baby where students must plan, implement and evaluate this experience. What I was reminded of from this exercise is trust is an important component in experiential learning, students trust me to guide them, they trust themselves (and give things a go), they trust each other while working in teams. We as educators set this scene and can build the environment which is most conducive to this.